One might not know what the project portfolio management software is. Some of you might not even have heard about it. But the chances are that your company needs this in a big way. Any organization which is looking to attain its milestones via technology and business initiatives requires understanding this concept. PPM (project portfolio management) software is the unified management of methods, technologies, and processes used by project teams to evaluate and oversee proposed or current projects based on various criteria. The goal of project portfolio management software is to help organizations achieve their goals, take into account the factors such as regulatory restraints, customer demands and external market states by finding the best feasible combination of the resources. PPM software refers to the collaborative efforts of organizations to coordinate and centralize project attempts across the work portfolio. Portfolio management software helps streamline the planning, automate processes, deliver and manage each project. Before you start taking on the project portfolio, it is important to get yourself the best PPM software. 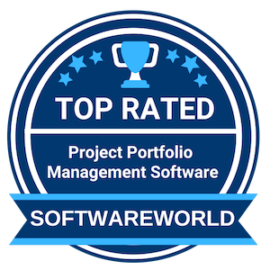 And to help you choose one, we have reviewed the 10+ best project portfolio management software. These reviews and ratings taken here are taken from the reliable websites such as GetApp, Capterra, and G2Crowd. What are the Best Project Portfolio Management Software in 2019? About Samepage : Samepage transforms the way business teams work together. Imagine all your team’s files, tasks, conversations and shared content in one place. Create a page in minutes, then connect and collaborate instantly. No exaggeration. Easy to create. Easy to use. Easy to succeed. Samepage makes it easy to get more done – efficiently and effectively. About Ganttic : Ganttic is high-level, online resource planning software, which can be used for managing a project portfolio, while also planning resources with maximum efficiency. With Ganttic, you can create clear and comprehensive visual plans that give you an instant overview of all your resources and projects. Ganttic is highly flexible, designed to be used in whichever way that fits your organisation’s needs. Whether you are looking to build a very simple resource scheduling system, a complex resource management system, or something in between, Ganttic can help you to get things done. About RationalPlan : RationalPlan is a project management software that follows the general recommended guidelines from project management domain. It has been developed to help project managers keep their projects on time and within budget. Our goal is to make the process of planning projects as short and as straightforward as possible, guiding novice project managers through each step but offering enough tools to those more experienced. “It is web-based and has better compatibility among different OS, it has similarbut better features than MS Project which include task and Gantt Chart features that the executives work with want to see. It integrates with Outlook, so tasks can be emailed to responsible staff. ” – Nirmal j. About ITM Platform : ITM Platform is a complete and intuitive cloud-based solution for project, program and portfolio management where strategic planning, business alignment and governance meet simplicity, team collaboration and ease of use. ITM Platform is Project and Portfolio Management made easy. Manage agile and waterfall projects, prioritize what’s best for your business, control project financials and use real-time information to tell senior management how projects are performing. ITM Platform connects your entire organization in a collaborative space that takes mere days to adopt. “I found it very useful. Using Accelo i can manage my all the task like my emails, messgaes, and other client related task. I can also track the progress of task like which task are completed and which are pending and accodingly i can manage those task. It saves my time.”- Gourav S.
About Sciforma : Sciforma is one of the largest providers of Portfolio & Project Management software, delivering solutions to a quarter million users worldwide since 1982. Leader in enterprise- level PPM solutions, our company is also recognized as a positive player by Gartner’s MarketScope™ for project and portfolio management applications and as an innovator by InfoTech Research Group’s Vendor Landscape Enterprise Project Portfolio Management report. “The software is definitely very simple to be used and it doesn’t need customization because the “out of the box” features are very wide. The team accepted the change and in a short time we have been running at 100%. Simplicity in the use and ready to start procedures made the change very quick and effective. ” – Gianmarco F.
About Deltek Project & Portfolio Management : Deltek’s Project & Portfolio Management suite helps businesses and organizations drive project and portfolio management through informed project selection, realistic planning, reliable execution and, ultimately, consistent project success. Manage costs, forecasts and performance with Deltek Cost and earned value solutions. Build the most realistic project plans with Deltek schedule tools, and accurately evaluate and manage risk exposure with Deltek Risk. “The updates get implemented automatically without the need to upgrade on-site servers, and the customer service is always very prompt. Deltek First takes a lot off the IT dept and gives it to administrator.” – Mallori B. About PPM – ECC : The PPM Executive Command Center (PPM – ECC) integrates organizational effectiveness through the Strategic Roadmap, PMO Governance, Tactical Execution, & Continuous Improvement. PMI Atlanta Chapter Awarded PPM – ECC “Project of the Year” & IIE Evaluated a 2.9 out of 3.0 (97%), and recommended for academics training. The PPM – ECC is equipped with automated metric computations evolving immature PMO Governance into maturity with “Quality Improvement Productivity (QIP). “Love the tool to allow execs to understand exactly where the gaps are using EVM and carry over amounts. It also measures cost of change requests and does forecasts so Portfolio, Program and Project Managers can make the appropriate adjustments. This can save money and a measuring tool for the portfolios effectiveness.” – Magaline H.
About Daptiv PPM : barometerIT brings unique clarity to your biggest business challenges by providing an up-to-date blueprint of your business and IT environment. Help leaders reclaim creative, future-oriented work by reducing the time necessary to support portfolios. Generate actionable information and identify redundancies, streamline processes, rationalize systems, and most importantly, make decisions using real-time information. “The software is great for companies like our who are new to managing and reporting on their projects in a consistent way. I was a project manager using the system to provide my leadership with updates and it was very easy to use.” – Amanda B. » IT Project Management Software – IT Project Management Software is considered to be one of the most important parts of the business projects currently. The software is being used in IT businesses for planning projects, scheduling the projects, resource allocation, and changing management. » ITSM Software – The ITSM software handles all the activities involved in the lifecycle of the IT services in an organization. So, it takes part in the design, creation, delivery, support, and management of the different IT services. » IT Management Software – With the improved technological advancements, the IT management software is beneficial for your business as it can automate simple tasks, unify the different software projects, and manage the collaboration of different projects.